← We Have a Scooter! 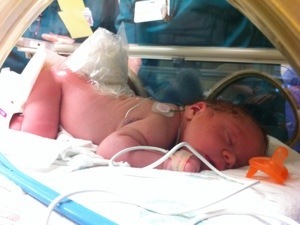 As I finally sit down to write another post, it’s 10:30 PM on Colten’s 1st birthday. A year ago today he was getting into an ambulance and heading down to the University of Michigan C.S. Mott Children’s Hospital. I had held him for three glorious hours and kissed him goodbye. We were told he would be wheelchair-bound. That he had no movement and no feeling in his legs except a slight hint of something in one of his thighs. We were actually given the option to “do nothing” – which would, in the end, mean death. SERIOUSLY?! 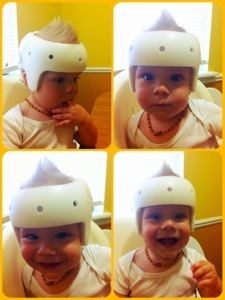 I cannot imagine this child NOT in our life. I cannot imagine why not being able to use his legs in a typical fashion would ever warrant someone saying “do nothing”. Bladder and bowel issues? Yeah, aggravating for us but I imagine more aggravating for him later on. Oh right, and the hydrocephalus thing. Yeah, it’s crappy. Yes, he needs a shunt for the rest of his life. Yeah, it can fail (and did after the first two weeks). Yeah, we still feel his darn fontanel every day. Yes, if it fails it’s life threatening. But he has a shunt. He is fine. He is wonderful. He is HAPPY and he is MOBILE (without a wheelchair mind you). And he is ONE!!!! 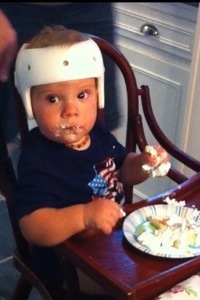 HAPPY FIRST BIRTHDAY COLTEN! Let me catch you up on a few things, as it’s been about three weeks since our last post. We mentioned Richard got a job on the east side of the state and was commuting 3 hours roundtrip. Long long days. We attempted to move about a week and a half ago and the house had some major issues. We got out of it (well, almost – our stuff is still there), are staying at my parents’ (huge thanks to them for taking in our family of 5! They just cannot seem to get all of their children out of their house for good… we love them too much to see them so lonely! ), and expect to move in to our final landing place in about a month. I’m not holding my breath though. However, bonus about the new house is that it’s a ranch which makes things easier for Colten (still will have to figure out basement steps though) and the backyard is smooth, flat and has a very nice ground-level patio – no extra stairs. So in the end, we hope this is all for the much much better! And Colten? This kid is hilarious and he knows how to get into trouble. He laughs all day – at himself, us, his brothers, anything. Cracks up. He army crawls like a champ now and gets BOTH knees into the action (he was leaving his right leg behind when he first started this movement). He just started trying to pull up when at a chair or step or something. He gets his arms and torso into the action but hasn’t quite figured out what the heck to do with the rest of the body below the waist when going upward. So he doesn’t get very far 🙂 But he’s trying! Here’s a video of Colten today with his new fire truck. It’s actually a ride-on toy but we kept the wheels off for now. It’s soft and low to the ground. We hope to encourage some climbing with this. You can get a good idea of how he moves around everywhere from watching this! He still wears the helmet 23 hours a day (24 if I forget to take it off) and is starting to mess with it a bit more – probably because it makes Momma react. The orthotist removed the foam padding on the sides of the helmet to give his head more encouragement and less resistance to growing outward. It’s not re-shaping very well. Best we can do is leave him in it and hope for improvement. His left eye is still drifting inward sometimes which is most likely a result of the flattening on that side of the head putting pressure on those eye muscles. Hopefully as the head shapes more properly the muscles can strengthen and straighten his eye out. His AFOs are the cutest little darned things. He hasn’t had any PT though for a few weeks because we transitioned out of our old school district’s early intervention program and are waiting for the new school district to get in touch with us. Although our next home will be in a different county so I should probably get on switching that up. 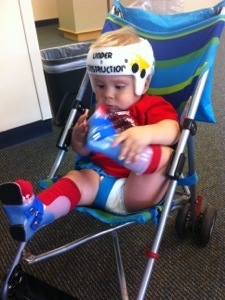 Colten will start outpatient, weekly physical therapy next week, and will wear his AFOs for that. Meanwhile, he wears them when I remember to give him treadmill practice (yes, still doing that. sometimes), and for about 10 minutes most days when I do a little weight-baring work with him (having him try to stand at an activity table, edge of couch, etc…). Colten is eating better. And he eats everything. He rarely chokes on food anymore and is self-feeding finger-foods. This was a huge win for us after going through a couple months where it felt like he would never move past pureed food. Although he doesn’t sleep better. He used to sleep all night, every night. At least 8 hours. Now he wakes up every few hours between 7:30pm and 6:30am. It’s not fun! He must be trying to figure out all these new moves he’s working on. He also now lays on his belly sometimes when sleeping – something he has not done since his spine closure at 2 days old! And for the first time we found him sitting up in bed after waking up! Usually he just lays there till we come get him. Both simple little things but milestones in our eyes! So, one year later. It’s been quite a year. We cannot wait to see what year #2 holds! Colten is so fortunate to have parents who believe he can “do things” vs a ” not even try” attitude. He will flourish in life! I know a young man with SB who when taught to swim actually gained so much confidence he joined the high school swim team. (He was wheelchair bound.) Happy Birthday Colten! You go young man!! We have seen a few stories of kids with SB excelling at swimming. Colten starts outpatient PT this week and I requested a therapist that utilizes the pool. We’ll start him early. It’s one of the few sports a person with a lower body physical disability can participate in with peers, as opposed to a wheelchair version. We recently saw a great piece about a young boy in Grand Rapids who plays high school tennis – he also happens to use a wheelchair. We just hope we can raise Colten to try his best at whatever he chooses! The YouTube piece was a bit like a silent comedy. Great adventure and spirit on this little guy’s part. He is a cutie! Happy Birthday Colten. I am glad to hear all is going well and everyday is a new adventure.